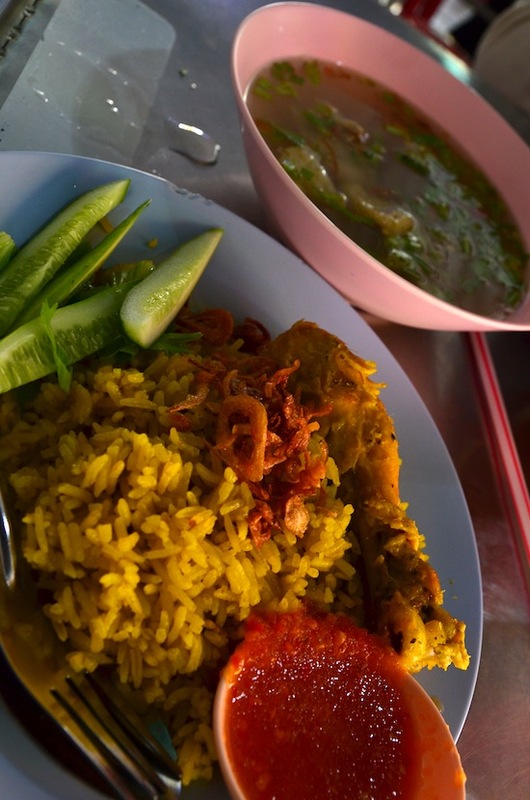 Muslim-Thai biryani rice with chicken, or khao mok gai, is a fairly common street dish that’s especially popular in Southern Thailand. One of the finest versions we’ve come across in Bangkok is served by one of the many street carts found on food-heavy Soi Convent, just off Silom and around the corner from Sala Daeng BTS station. It gets busy at lunch time. 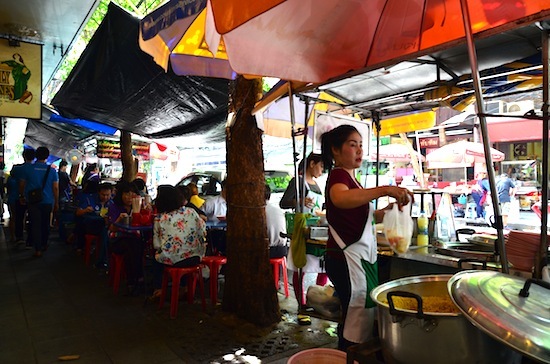 Set up under plastic umbrellas and awnings alongside several other carts that each specialise in a typical street dish, like khao man gai and kuay thiao, the nameless stall is easy to spot thanks to a huge cauldron of yellow rice boiled with turmeric. Its location directly below Bua Restaurant’s bright purple sign also helps. A standard portion features a good scoop of the rice along with fried shallot, fresh cucumber and a chicken leg with tender meat that falls off the bone. Prepared with a fairly heavy amount of krueng tet Islam (“Islamic spices”), the rice has a bolder flavour than most of the khao mok we’ve tried. It warms the mouth and is very flavourful, but without being over-spiced. Each plate is served with an orange sauce that looks like the sweet stuff commonly served in Thailand with fried chicken, but in fact it adds a sour and spicy flavour. The rice and soup go together like a bow and arrow. Sour and spicy is definitely the right compliment for the rich rice and chicken, and while the sauce is good, the chef’s homemade sour chicken soup is a must when dining here. The portion that we were served came with generous chunks of white-meat chicken bobbing in a broth of fiery green chillies, cillantro and lime. A regular portion of khao mok gai goes for just 35 baht while the soup costs an additional 30 baht. If you’re really hungry, request piset gai for an extra chicken leg, or piset khao for extra rice. After ordering from one of the snappy servers who hover around the chef at the cart, grab a seat at any of the streetside tables. The various carts share tables so don’t worry if there are no seats right next to the cart. Other fine options in Bangkok for khao mok gai include A-Isa Rot Dee and Home Cuisine Islamic Restaurant.